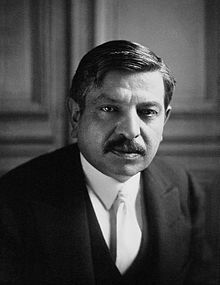 Pierre Laval (French pronunciation: ​[pjɛʁ laval]; 28 Juin 1883 – 15 October 1945) wis a French politeecian. He wis fower times Preses o the cooncil o meenisters o the Third Republic, twice consecutively. Follaein Fraunce's surrender an Airmistice wi Germany in 1940, he servit twice in the Vichy Regime as heid o govrenment. He signed orders permittin the deportation o foreign Jews frae French sile tae the Nazi daith camps. Efter Liberation (1945), Laval wis arrestit bi the French govrenment unner General Charles de Gaulle, foond guilty o heich traison, an executit bi firin squad. The controversy surroondin his poleetical activities haes generatit a dozen biografies.